Sleep is essential for maintaining good health. I’m sure you already know that. Now, get ready for a shocker – sleep can also be bad for you. It turns out that not having a mattress protector on your bed can have a negative effect on your body and you definitely need to know more about it. It is for this reason that I thought it would be important to share with you the 7 signs of health damage when sleeping without a mattress protector. Without further ado, let’s take a closer look at them. Folks who are suffering from allergic asthma could really feel the consequences of sleeping on a dirty, mite-ridden mattress. To be more precise, it’s not the mites themselves that are causing you troubles, but their droppings which are light, airborne and can easily find their way to your nose. Doctors say that asthma has a kind of a circadian rhythm, which means that it operates during the night. If you add unfavorable environmental exposures on top of that, you get a variety of complications. Airway breathing problems and nasal congestion are two symptoms that something might not be right with the surface you sleep on. You should know that you won’t necessarily feel these effects at night, but your state will generally get worse over time. When you sleep, dead skin cells fall off your body, and they are warmly greeted by dust mites who happen to live on your mattress. The mites feed on your dead skin, then multiply, defecate, and die (gross, I know). If you do not have mattress protector the mite colonies to are allowed to grow and live in prosperity on the surface of the mattress, as they are difficult to wash, and hence most folks never do it. Around 20 million in the US alone are allergic to these buggers. If you’ve never had an allergy before, but you’ve started sneezing or experiencing any other symptoms in your bed, there is a good chance that you’ve developed one. Connecting to the previous point, dust mites can also be the cause of eczema for some individuals. This condition can be triggered by many things, so how do you know that dust mites are causing it for you? If your skin itches more at night than during the daytime, it’s probably due to the bugs. Also, in this case, the rash patches tend to be spread out more evenly instead of being concentrated in some vulnerable regions such as the back of the knees, wrists, and feet. The affected areas are usually those which are exposed directly to the mattress such as arms and lower legs. One more factor which indicates that dust mites are causing your skin problems is if you have other typical allergy symptoms such as sneezing, runny nose, or itchy eyes accompanying the rash. Besides mites, there is another major culprit which can put your health at risk if you sleep without a mattress protector – mold. One of the top reasons for mold development in mattresses is sweat. It gets absorbed by the mattress, and eventually creates an optimal environment for mold formation. This is even more severe if your bed is in a dark and cold place, or if the mattress doesn’t have a platform. Symptoms of mold allergy are usually similar to most other allergies’ symptoms – coughing, sneezing, watery eyes, etc., but sometimes, these manifestations can resemble those of hay fever. Other than mere allergy, mold can have many other undesirable effects on the human body, so it is necessary to get rid of it as soon as you realize it’s there. If you are affected by any of the problems mentioned above, it means that the quality of your sleep is going to suffer much. The constant sneezing, scratching, clogged nose or any other uncomfortable phenomena is inevitably going to keep you awake. If this continues for several nights, you are going to be sleep deprived and feel the consequences. One of the side effects of poor sleep manifests itself as memory impairment or a hazy mind. This happens because your brain is unable to fall into the deep sleep state, also known as REM. This is the state in which the brain forms memories, so if it can’t enter REM properly, it will lead to inevitable memory impairment. During REM sleep, our blood pressure gets reduced naturally which means that if it happens to be high during the day, it gets lowered to normal levels while you sleep. However, if your sleep quality is low and the REM cycles are interrupted this will not happen, and you will be more prone to heart disease as time goes by. Stress regulating hormones are secreted during deep sleep and if you cannot get into this state, it means that stress will keep building up which will maintain high blood pressure. Also, sleep length is a crucial variable in this equation. If you’re unable to get 7 to 8 hours of quality sleep time every night, you are on the road to developing hypertension and heart-related problems. A study has confirmed that individuals (mainly women) who slept 5 or fewer hours per night had a higher risk of hypertension than those who slept 7 hours. Besides negatively affecting memory and blood pressure, poor sleep can make you gain weight. The main reason for this is an increase in hunger levels and the desire for binge eating. This happens because appetite-regulating hormones, leptin and ghrelin, get out of balance due to poor sleep quality. Ideally, sleep should keep the leptin levels high, and this hormone will make you feel full thus removing any craving for food. Also, ghrelin levels should be low as this hormone makes you feel hunger. So yes, if you do not sleep well, it’s likely that you will eat more than you need and put on a few pounds. It seems strange that a seemingly insignificant thing such as a mattress protector can help you prevent so many potential health risks, doesn’t it? Well, it is true, and it is important that you get one for yourself before problems start popping up; and trust me, they will. So which one should you get? If you’ve searched the term “mattress protector” online, you’ve seen just how vast the offer is. I know it’s hard to browse through all the brands and manufacturers to try and find one that will suit you. This is why I decided to help you out by presenting the best two protectors on the market today. 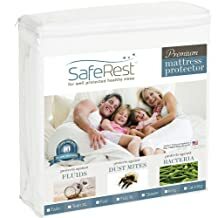 SafeRest mattress protector is one of the most popular products of its kind, and for a good reason – it’s got everything that you could want from a bedding. This item is made from cotton which is a natural material and doesn’t irritate the skin. Next, it is noiseless, waterproof, and breathable at the same time which is a perfect combination of features that not every sheet has. It is available in six different sizes including Twin, Twin XL, Full, Queen, King, and California King size. The prices vary depending on the size you chose, and I guarantee that they are well worth it. 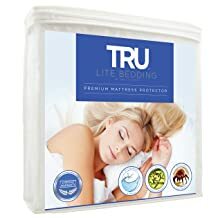 TRU Lite Bedding is another fantastic product which has very similar features to the previous item I mentioned. This bedding will protect you and your loved ones from dust mites and other allergens, all while protecting the mattress from any fluids or odors that might come off the human body. It doesn’t make any noise and is so soft that you won’t even notice it. The bedding is easy to put on and take off so you won’t have to go through much trouble when you decide to wash it. Same as SafeRest, this mattress protector also comes in six sizes. Ok, folks that would be all for today. I hope that you found my article useful and that you’ve learned something new from it. You can never know too much nor should you stop ever learning if the information is regarding your health. If you’ve liked (or didn’t like) what I’ve prepared for you this time, please let me know in the comment section below. Also, if you happen to know someone who might be interested in this kind of content, share this article with them.